Take a look at the colorful street Masjid India and its typical shops held by the Indian and Muslim populations. 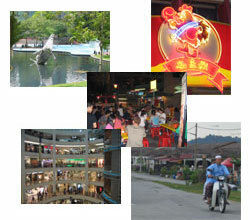 Incoutournable, 2 km west of the Petronas Towers and nearby Chinatown Kuala Lumpur, do not miss the night market. Feel free to make a visit to a Hindu shrine, for example the sanctuary of the Lord Murugah, north of the city, a Hindu deity, located in the hills of Batu Caves, a cave as his name implies. You can also visit the Sri Maha Mariamman Temple and smells of jasmine, sculptures, his songs continued. The museum Etaing Royal Selangor Pewter, which is also the largest factory of the world Etaing, Etaing renowned for its purity. The quality craftsmanship will charm you certainly after discovering manufacturing processes: casting, filing, polishing, welding, hammering and engraving. autombile Proton brand born in 1983 on the political state of Malaysia is in turn located in the suburb of Kuala Lumpur, Subang Jaya. 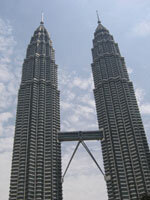 Petronas twin towers are known worldwide and have been popularized by the movie High -Aerobatic. One of them is the headquarters of Petronas, the Malaysian giant energy that symbolizes the country's success. à 40 kilomètres au nord-est de Kuala Lumpur, le parc de Kuala Gandah, créé en 1989. Il vise à protéger les éléphants, qui sont fréquemment confrontés à la présence humaine. Plus de 300 éléphants sauvages ont ainsi été déplacé ces 25 dernières années. Bien sur le circuit auto-moto, une trentaine de kilomètres au sud. In two days and one night, you should get to tour the monuments, tours and attractions below. To the discoverers, everything is less than 10 square kilometers, 5 kilometers rather excluding Batu Cave and it will take a taxi. Add to bookmark this page Malaysia " Tourism Kuala Lumpur " - Firefox do "Ctrl D"